This story was updated at 11:30 a.m. EDT. The space shuttle Endeavour is soaring through the California sky to take an airborne sightseeing trip around the Golden State today (Sept. 21) on the way to its new museum home in Los Angeles. Endeavour, riding piggyback atop a modified Boeing 747 jumbo jet, took off from Edwards Air Force Base in Southern California at 8:17 a.m. PDT (11:17 EDT/1517 GMT) to begin a 4 1/2-hour farewell tour to make low flyovers of Sacramento, the San Francisco Bay Area and Los Angeles Basin. 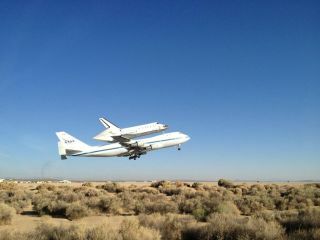 "Wheels up," said NASA spokeswoman Amiko Kaudererin a webcast as the shuttle soared into a blue California sky. "Endeavour is the youngest of the space shuttle fleet, now headed to its future home at the California Science Center." Endeavour is being ferried around California atop NASA's Shuttle Carrier Aircraft, a 747 jumbo jet specially modified to carry the immense weight of the winged spaceship on its back. The shuttle and carrier aircraft will make low flyovers over Edwards — home of NASA's first shuttle landings — and NASA's nearby Dryden Flight Research Center in a farewell salute before continuing with their California tour. NASA televised the takeoff from Dryden live on NASA TV and in an online webcast. NASA is encouraging the public to share their shuttle Endeavour viewing experiences by posting messages and photos on the social networking website Twitter using the hashtags #spottheshuttle and #OV105. The latter tag refers to Endeavour's vehicle number designation. Endeavour and its Shuttle Carrier Aircraft are heading north to make morning flyovers of Sacramento, California's capitol city. Then the shuttle will head to the San Francisco Bay Area for another series of low passes. "Any time after 9:30 a.m. PDT, watch for Endeavour from viewing locations that include the Bay Area Discovery Museum, Chabot Space and Science Center, the California State Capitol, Exploratorium, Lawrence Hall of Science and Monterey Bay Aquarium," NASA officials said in an announcement Thursday. Next, Endeavour turns south to soar over NASA's Ames Research Center in Moffett Field, and later Vandenberg Air Force Base, which has long served as a launch site for NASA and Air Force satellites. Then, it will be time for Endeavour's grand Los Angeles arrival. "Any time after 11:30 a.m., watch for flyovers of Endeavour passing regional landmarks such as its future home at the California Science Center, Columbia Memorial Space Center in Downey, Disneyland, The Getty Center, Griffith Observatory, Los Angeles City Hall, the Long Beach Aquarium of the Pacific, Malibu Beach, NASA's Jet Propulsion Laboratory in Pasadena, the Queen Mary, Universal Studios and Venice Beach, among others," NASA officials said. Endeavour is expected to land at Los Angeles International Airport at 12:45 p.m. PDT (3:45 p.m. EDT/1945 GMT), and will be greeted with an official arrival ceremony before the shuttle is hoisted off its 747 carrier plane. The shuttle will wait at LAX until October to be transported to the California Science Center. NASA Social Media Team tweeted this photo on September 21, 2012 and wrote: "The #NASASocial guests bidding a @NASADryden farewell to a dear friend. Go Endeavour! #spotheshuttle pic.twitter.com/1ZXyii6W." On Oct. 12 and 13, Endeavour will parade up the streets of Los Angeles to make its final trek from LAX to the California Science Center. The public display of the shuttle at the center will open on Oct. 30. Endeavour is NASA's youngest space shuttle and is the only orbiter to go on public display in California, the birthplace of the U.S. shuttle fleet. The orbiters were built at a facility in Palmdale, Calif., and occasionally returned for service overhauls during NASA's 30-year space shuttle program. Endeavour is the third of four space shuttles heading to museums this year. In April, the shuttle Discovery went on display at the Smithsonian Air and Space Museum's Stephen F. Udvar-Hazy Center annex in Chantilly, Va. In July, NASA's prototype shuttle Enterprise (which never flew in space, but was pivotal for early landing tests) went on public display in New York City's Intrepid Sea, Air and Space Museum. On Nov. 2, NASA's remaining space shuttle Atlantis will be towed from its hangar at the Kennedy Space Center to the nearby Kennedy Space Center Visitors Complex, where its own museum display will open to the public in summer 2013. NASA retired its space shuttle fleet after 30 years of spaceflight and 135 missions in July 2011. The space agency plans to use privately built space taxis to ferry astronauts to and from low-Earth orbit, while at the same time developing its own new spacecraft and rockets for deep-space manned missions to an asteroid and beyond. If you snap a photo of Endeavour ferry flight overhead, share your photos with SPACE.com and partner collectSPACE.com! Send in your snapshots of Endeavour atop its Shuttle Carrier Aircraft to SPACE.com managing editor Tariq Malik at tmalik@space.com and collectSPACE atcontact@collectSPACE.com.